The Scottish writer and teacher Gerald Howat, who died in 2007, was the author of 20 books, including a number on cricket – he is recalled for his acclaimed biography of Learie Constantine (and also taught in his subject’s native Trinidad) as well as titles on Walter Hammond, Plum Warner and Len Hutton. 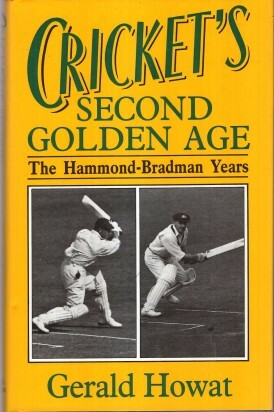 Here he revisits the career of Hammond, and his great nemesis Donald Bradman, subtitling this book ‘the Hammond-Bradman Years.’ He takes as his starting point Hammond’s debut in August 1920, and ends with the Don’s farewell in March 1949. There is plenty about Bodyline of course, but Howat points out that (even in 1989) a number of books had appeared on that series, and the dozen or so pages he devotes here are quite sufficient. Interestingly, at the end of such an acrimonious series, the state premier of New South Wales declared at a dinner given for the tourists that ‘our visitors played cricket in the best tradition of the British people’ – a view somewhat at odds with most of his countrymen. And there are a few good anecdotes – Neville Cardus once met Wilfred Rhodes and Emmott Robinson on a Sunday in London, remarking on the fine weather after the rain, and they grumbled that there was ‘a sticky wicket wasting at Lord’s.’ The illustrations include a number of contemporary cartoons as well as one photograph of the ill-fated airship R101 over Lord’s during the 1930 Ashes Test. To deal with almost thirty years of cricket, around the world, in a book of this size meant that many seasons and series had to be given light treatment, but nothing of importance has been omitted here, and as a brief guide to the interwar and immediate postwar years, this does its job. Cricket has witnessed historic moments. Including the great players of all the time like Sir Donald Bradman Australian Captain, Graham Gooch England, Sir Viv Richards West Indies and so on….. All have contributed to making this game watchable over the time period.